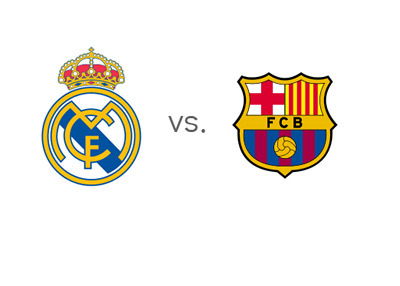 With ten games to go in the season, Real Madrid host Barcelona in a potentially title deciding fixture on Sunday, March 3rd, 2014 at Santiago Bernabeu. A win for Los Blancos would create a distance of seven points between the two teams, while a win for Barca would mean that the race is on. Real Madrid are in top form these days. Cristiano Ronaldo seems to be at his best, while Gareth Bale is performing on a high level as well. Both players played mid week in a 3-1 UEFA Champions League victory vs. Schalke. Real Madrid are undefeated in their last 32 matches across all competitions. Guess who defeated Real Madrid last? Well, it was Barcelona back in October when they won 2-1 at home in the league. If I remember correctly, Alexis Sanchez scored a pretty sweet goal. Lionel Messi and Co. are in strange form these days. They outclassed Manchester City in the UCL and beat Osasuna 7-0 the other day in the league, but they suffered a couple of recent losses vs. Real Sociedad and Real Valladolid that might end up costing them the domestic title this season. According to the odds, Real Madrid are going to take care of this one and continue their unbeaten streak. This could be another epic battle, especially if Barcelona turn it on. The kick off is at 9pm local time.